Clinton is the managing director of City Print. 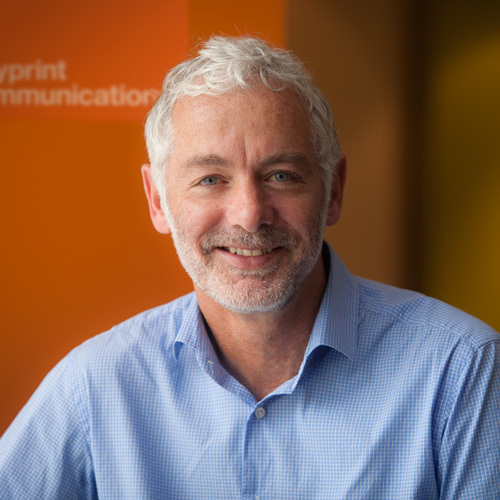 Clinton founded the company in 1985 and has led the growth of City Print to become one of New Zealand’s leading technically savvy commercial printers. He has a passion for customer-led business development, and over the last three decades has overseen the company’s expansion into high-quality direct mail, creative, digital, and asset management services. Clinton is actively involved in the business as an account director. Clinton is also the CEO of Flex Media Group, a company specialising in the execution of people-centred communications solutions, and is a director of City Print’s sister companies Wakefield Digital, Uview and StockView. 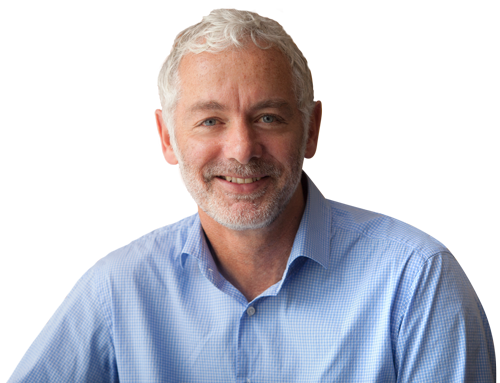 Clinton holds a Diploma in Business Management and is an alumni of the University of Auckland’s Icehouse Owner-Manager programme. He enjoys the great outdoors, but on a Saturday morning you’re more likely to find him on the sideline of a sports field cheering on one of his three children with partner Lisa. 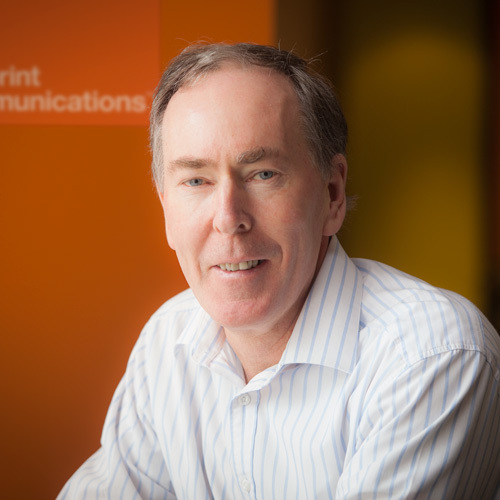 Jim is our account director of sales, providing great service to City Print clients. He works closely with our studio and production teams, making sure projects are delivered to the highest standards, on-time and on-budget. Jim gets huge satisfaction from seeing customers receive an outstanding product and value for money. He believes everyone gets the best result when expectations are clear, and is committed to proactive, no-surprises client relationships. Jim has a strong understanding of client needs and the production process from his experience in design, print and delivery positions. 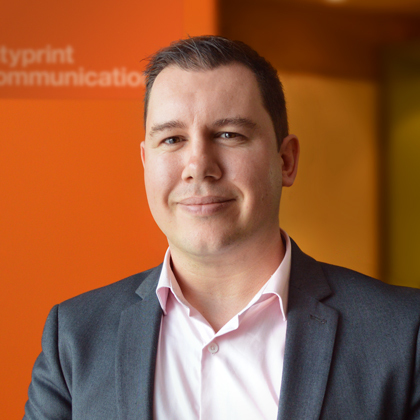 He was previously the manager of a Wellington-based graphics company, has held roles in advertising and marketing for a major newspaper group, and was a sales manager for an international courier company. He is addicted to tennis, is an avid reader, and an enterprising home brewer. Jim is a member of Big Buddy Mentoring Trust, helping to give fatherless boys confidence and purpose and make positive life choices. Darrell is our senior account manager, who loves helping clients with their projects. He enjoys a challenge and is always looking for ways to create something unique. He believes the client experience should be smooth as possible. 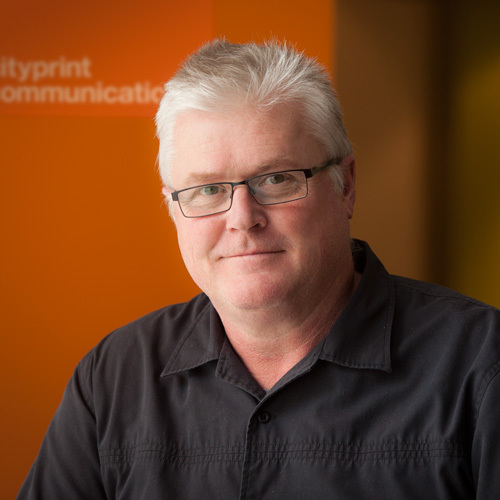 Darrell has recently returned to Wellington to be closer to family after spending six years working in the Brisbane print industry. In Darrell’s earlier years he worked as a chef and still loves to cook up a storm in the kitchen (the City Print staff are still waiting to judge his skills). In his free time Darrell likes to spend time with friends and family, cheer for the All Blacks and yell at the NZ Warriors. John is City Print’s studio manager. A graphic designer by profession, he has spent 30 years plying his trade, including 17 years as a freelance designer. John believes design plays a key role in shaping society and how we see the world. His design philosophy is an inclusive one – it’s about the customer, and while John’s happy to deliver to a brief, he likes to involve the client in the design process as much as possible. John loves to research the many and varied projects he’s involved in, and when it comes to executing he is accurate, fast, and excels in the detail. John holds a Diploma in Design from Wellington School of Design, and his passion for his work is as fresh as the day he graduated. He loves gardening and landscaping, is a keen fisherman, and enjoys oil painting as a creative balance to the structured design process. 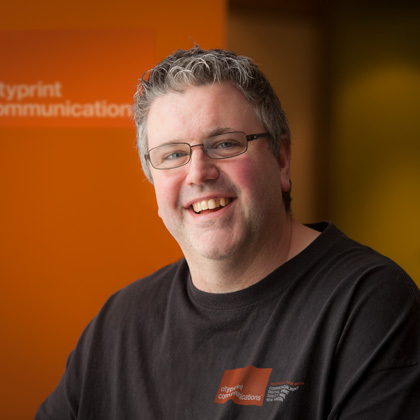 David is City Print’s operations manager. Born in Yorkshire, England, David has worked in the print industry since 1987, spending 25 years of that time as an offset printer. He oversees the production process for large commercial print jobs, drawing on his considerable experience and technical knowledge to ensure City Print always delivers products of exceptional quality and value. Outside work David is family oriented. He is married to Sophie, a local artist, and is a keen amateur after-dark photographer. Like other members of the City Print team, David enjoys the great outdoors, especially surfcasting and camping with his two sons.